This Halloween marks the ninetieth anniversary of the death of the great illusionist Harry Houdini. Born Ehrich Weisz in Budapest in 1874, he got his start as a trapeze artist before turning his attention to magic. He took the name Houdini after the popular French magician Jean Eugène Robert-Houdin. When Houdini died of a ruptured appendix on October 31, 1926, he was one of the best-known illusionists in the world. Unidentified photographer, [Harry Houdini in a publicity photo for his silent film The Grim Game], 1919. Gelatin silver print, 20.3 x 25.4 cm. Houdini’s papers were dispersed through his estate following his death and that of his wife, Bess, in 1943. One of the larger collections of Houdini’s papers went to Messmore Kendall, an attorney, entrepreneur, and theater manager. In June 1958, Kendall gave his collection to The University of Texas at Austin’s Hoblitzelle Theatre Arts Library, which became part of the Ransom Center in the 1960s. The collection holds a variety of material documenting Houdini’s personal life and career—handwritten descriptions of magic tricks; scripts, posters, and press kits from his motion picture company; decades of business and personal correspondence including a series of love letters with his wife; and materials relating to his interest in debunking spiritualism. Houdini’s own collection of materials relating to other magicians forms a large part of the collection. Fascinated by how other magicians marketed themselves and always eager to learn new tricks, Houdini would often reach out to magicians and purchase their papers directly from them. Houdini’s collection of magicians spans over a century of international illusionists that include major figures like his namesake, Jean Eugène Robert-Houdin, and lesser-known performers who traveled the vaudeville circuits. Unidentified photographer, [Harry Houdini in chains and ball weights with police], ca. 1900. Gelatin silver print, 14 x 9.5 cm. 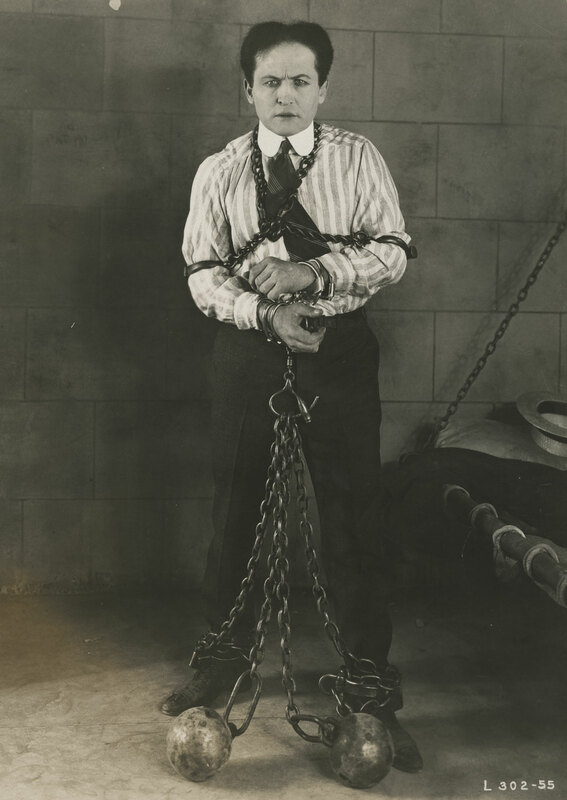 Houdini was also a collector of American and British theater history, and a significant part of the Ransom Center’s early theater holdings came from Houdini. The recent Ransom Center exhibition Shakespeare in Print and Performance included a travel diary from the great eighteenth-century actor-manager David Garrick that once belonged to Houdini. Since the arrival of the Houdini collection at the University in the 1950s, the Ransom Center has continued to build on our extensive magic holdings. The Ransom Center has multiple first editions of Reginald Scot’s Discoverie of Witchcraft from 1584, one of the earliest books in the English language to debunk witchcraft. The McManus-Young collection contains over 2,500 books on the art and history of conjuring, sleight of hand and stage magic, hypnotism, spiritualism, and witchcraft. The papers, library, and personal effects of Sir Arthur Conan Doyle largely relate to the Sherlock Holmes–author’s interests in spiritualism, and the Ransom Center holds the papers of notable British occultist Aleister Crowley. In April, we added to the collection one of Houdini’s ball weights with an ankle cuff and chain. You can see this iconic object on display in our lobby during the month of October as we host a series of Houdini-related programs celebrating the life and legacy of one of America’s great entertainers. One of Harry Houdini’s ball weights with ankle cuff. The Ransom Center has digitized a number of the scrapbooks, posters, and playbills from the collection. View them at http://hrc.contentdm.oclc.org/cdm/landingpage/collection/p15878coll22#nav_top. Editor’s note: To commemorate the ninetieth anniversary of Houdini’s death, the Ransom Center is hosting a series of programs, including a cooking class inspired by Houdini’s Hungarian heritage on October 16, a screening of the silent film The Grim Game (1919) on October 4 and a performance of “Houdini Speaks to the Living” with Austin-based theater company The Hidden Room on October 31. Visitors can view a display of materials from the Houdini archive in the Ransom Center’s lobby from October 1 through November 6, 2016. Dr. Eric Colleary is the Cline Curator of Theater and Performing Arts at the Harry Ransom Center. This article originally appeared in the Fall 2016 Ransom Edition. Colleary oversees research, access, and interpretation of the Ransom Center’s theater and performing arts materials.